Everyone loves Christmas. It’s a time of sharing, love, compassion, giving and receiving but also time for celebration with those you love. If you watched the movie “The Grinch stole Christmas”, you’ll know that the grinch is total opposite of what Christmas is. 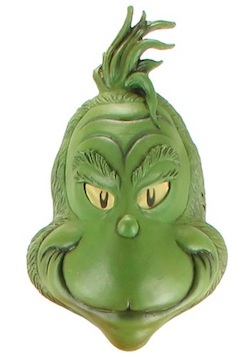 He’s a grumpy old green man who hates Christmas, grouchy and just totally wants to ruin Christmas for all the kids. Of course there is a happy ending to the Grinch, but you’ll have to watch the movie to find out what it is. 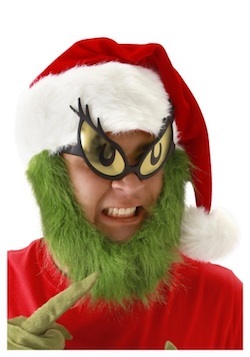 Find Grinch costume ideas below for adults. This hat and beard combo is perfect for making a quick transformation. Instantly you can look ready to steal away everyone’s Christmas joy. Although, we know you, being the big-hearted person that you are, will obviously give it back and make this Christmas season the most memorable one yet! Whether you’re a true bah-humbug Ebenezer Scrooge type or merely a Christmas eccentric, these cuffs will help you express your complicated feelings towards the season. Wear these underneath a standard Santa suit if you’re feeling especially sinister, or complete the set with the matching hat and legwarmers. Click here to get the Christmas Grinch fuzzy cuffs. This is the Deluxe Grinch mask for you. It’s a latex molded mask so you can wear the mug of your favorite Who from Whoville. Don’t worry, it has holes to hear, eye-mesh to see, merely pop it on and you’ll be green as a Christmas tree! This outfit’s surprisingly pleasant effects come from combination of the costume top, hat and half mask. The sheer netting on the mask’s eyes ensures you can see all the giddiness you’re responsible for creating. Well done! It’s no wonder your heart grew three sizes the day you slipped it on. 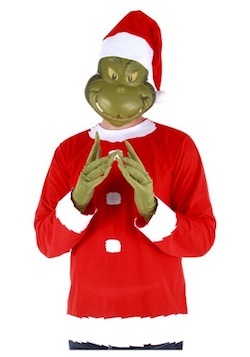 Click here to get the adult Grinch Costume. This costume is perfect for those who just aren’t feeling jolly during the holidays! It comes with a red polyester Santa jacket that has fuzzy white trim at sleeves and the bottom. The bottom of the coat holds its shape with a wire hoop. 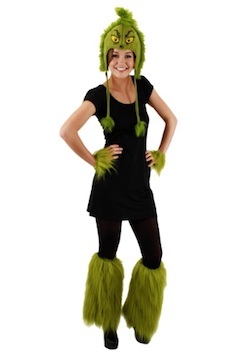 The costume also includes Grinch gloves with green faux fur and a vinyl Grinch mask for his signature scowl. And don’t forget the included Santa hat – it will complete the look! 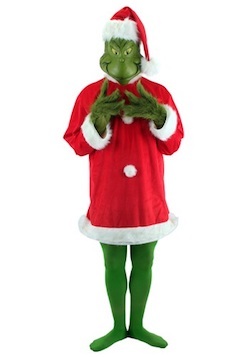 Click here to get the deluxe Christmas Grinch Costume for adults.